We recently told you about our Valentine’s Day dinner: Mary Katherine posted both the appetizer and the dessert. But what was the main course?! Here it is – Hanger Steak with Mushroom Demi Glace! It worked great with oven roasted brussel sprouts and garlic smashed potatoes. In case you’re new to the blog, we talk about hanger steak more than we probably should. This delicious cut of meat is one that comes highly recommended by Anthony Bourdain (who we also talk more about than we probably should…) We’ve found a great butchery that carries it for a good price, and so it’s rare when we can’t find at least one hanger steak in our freezer. 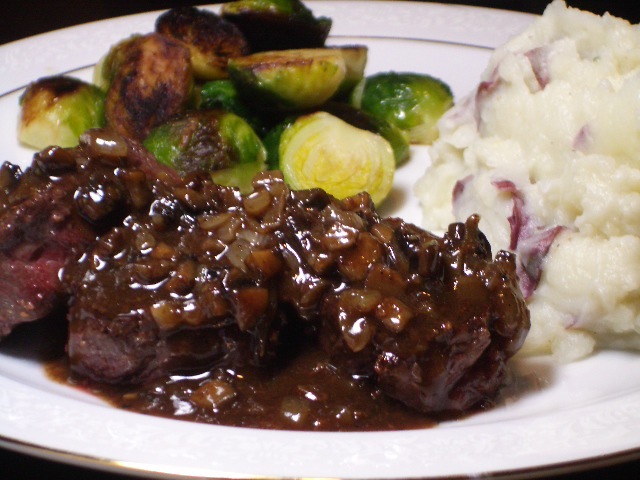 If you don’t have access to hanger steak, we still highly recommend this mushroom demi glace sauce for a ribeye, filet mignon, or any other cut of beef you’re having for a special occasion. We made our own veal stock and demi glace, but you don’t have to: D’Artagnan and other gourmet stores usually have these items in stock. So, whether it’s Valentine’s Day, an anniversary, or just plain Tuesday, get out the veal stock, a good cut of beef, and a few mushrooms and enjoy an awesome meal! I love hanger steak- a very unappreciated cut of steak indeed! Great dinner. Demi Glace is a wonderful sauce. Wonderful! What a beautiful meal. This really does look delicious.